More than 50 shamrock designs were considered for new brand. A wide-body aircraft takes about 10 days and about 850 litres of paint to repaint, the narrow-body takes between seven and eight days and uses around 500 litres. Last rebrand – with a reputed cost of €8m – was unveiled in February 1996, revealing slanty shamrock. In possibly the worst-kept secret in the travel industry – with images leaked online of the new look – Aer Lingus unveiled its refreshed brand with an updated logo and new aircraft livery, featuring more white than green. 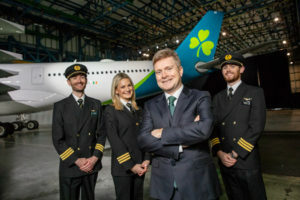 In what the airline said reflected its “position as a modern and contemporary Irish brand that competes on the international stage”, the slanty shamrock unveiled in 1996 is now even slantier. The new logo restyles the iconic shamrock, adding a tilt “to symbolise dynamism and speed, with heart-shaped leaves reflecting the warmth and hospitality of the brand”. Aircraft will feature four shamrocks: the first is within the new logo, the second sits on the tailfin, a third welcomes passengers at the door, with a final leaf on the wingtip. The Aer Lingus logo font has changed to ‘diodrum’ and the dominant colour is teal. The body of the aircraft will be white with a teal-coloured tail and engines. The brand refresh is being rolled out today across all brand platforms, with a new website design and new app design. It will be visible from check-in to boarding gate and on to the aircraft. The refresh is part of a growth plan to increase its North Atlantic fleet from 17 to 30 by 2023. Overall, it plans to grow its A330 fleet to 16 aircraft (from 13 in 2017) and invest in 14 new A321LRs to provide capacity for growth across the Atlantic and within Europe. The revamp – by New York brand agency Lippincott – was showcased to around 500 members of the trade, tourism and media at Hangar 6 in Dublin Airport. The lead designer on the project was Dubliner Brendán Murphy who has been working with Lippincott in New York for over 20 years. The A330-300 EI-EDY St Munchin was unveiled at the event, where it had been painted on-site. The A320-200 EI-CVA, St Schira flew from Shannon Airport, where it had been painted. The new liveried A330 aircraft will take to the skies for the first time tomorrow, Friday 18th, operating flight EI105, where it will be met by a reception in JFK Airport. Sean Doyle, Chief Executive Officer, Aer Lingus, said: “Aer Lingus is a modern Irish international success story, built on hard work, enterprise and the commitment of our people. We’re delighted to unveil our brand refresh today, which comes more than 20 years after Aer Lingus last invested in new brand livery, and reflects our position as a modern, contemporary airline. Aer Lingus has had exceptional success in recent years: adding new routes, new aircraft, new jobs and new opportunities. Mike Rutter, Chief Operating Officer, said: “Since 2015, we’ve invested significantly in our business, improving our value proposition and overall guest experience and becoming Ireland’s only four star airline. Innovations that we have introduced include the roll-out of WiFi on our A330s, automated check-in and bag drop at Dublin Airport, Business Class improvement with fully lie-flat beds and economy catering upgrades. We’ve also enhanced our performance to become the most punctual airline at Dublin Airport. The last rebrand – unveiled in 1996 as part of a two-year programme – had an estimated cost of £8m; the latest incarnation is reckoned at around €2m.